Microscopy using Förster resonance energy transfer is a potent method for imaging protein conformations and interactions. However, the technique has two conflicting requirements: the necessary spectral overlap between the donor molecule’s emission and the acceptor’s absorption ranges and the need for an appropriate amount of separation between the donor’s and acceptor’s emission wavelengths. In the March 14 issue of PNAS, they report that the variant has an excitation maximum at 510 nm and a relative fluorescence of 0.03 at 538 nm. 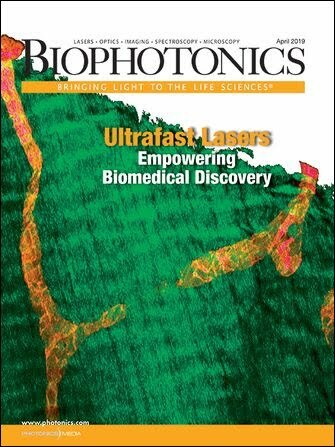 Using a Ti:sapphire laser from Coherent Inc. of Santa Clara, Calif., a confocal microscope made by Leica and a multichannel plate photomultiplier from Hamamatsu Photonics KK in Hamamatsu City, Japan, they found that the protein’s emission lifetime is ~320 ps, compared with 2.9 ns for enhanced YFP, and that its Förster distance (when paired with GFP) is 5.9 nm, compared with 5.6 nm. The lack of emission from the variant means that spectral overlap can be optimized through the choice of donor, improving FRET detection because more photons can be collected with less of the background noise that is typically generated by acceptor emission. It also means that there is a wider spectral band for additional fluorescing components, which should help facilitate multiplexed imaging of protein interactions within cells. The researchers acknowledge that the small amount of residual fluorescence of their creation may not be negligible for some applications. However, they foresee using the mutant YFP for fluorescence lifetime measurement and for laser-scanning microscopy.